renewal notice before the end of January. Registering your pet is a municipal bylaw? The regulations of many municipalities in the Townships state that any pet owner must register him or her at the Eastern Townships SPA. The registration is valid from January 1st until December 31st of each year? 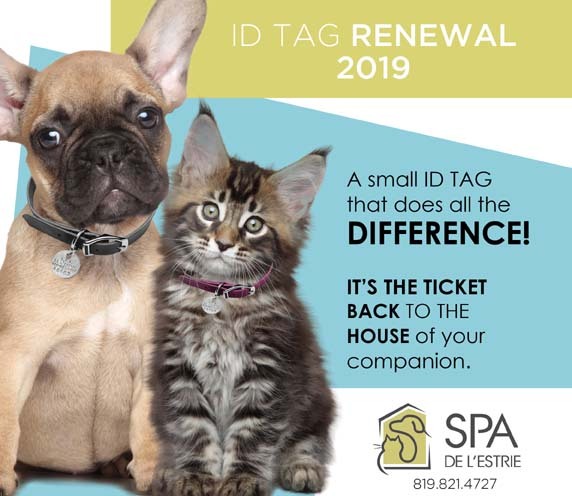 ID tag or the number on it has erased over time, call the Eastern Townships SPA at 819-821-4727, option 4. A new ID tag will be mailed to you. You must pay the registration renewal before February 15th 2019? bylaw, failure to comply may result in a fine of no less than $50. You are entitled to a $10 rebate if your pet is spayed or neutered? payment or sent it to the Eastern Townships SPA by fax at 819-823-1573. You will then benefit from a $10 rebate on the regular fee for your pet’s registration. You no Longer Have a Pet? personnel can update your file. You Have A New Four-Legged Friend? You Have Moved? For more information, do not hesitate to contact us at 819-821-4727, option 4. It will be a pleasure to answer your questions.